On a rainy Friday evening, two major headlines were coming out of Columbia: Dierks Bentley’s Mountain High Tour rocks the house and Merriweather is open for business. After a sudden roof collapse during a renovation project in January left many wondering the fate of the 2018 concert season, Merriweather vowed the shows would go on. They have not disappointed. 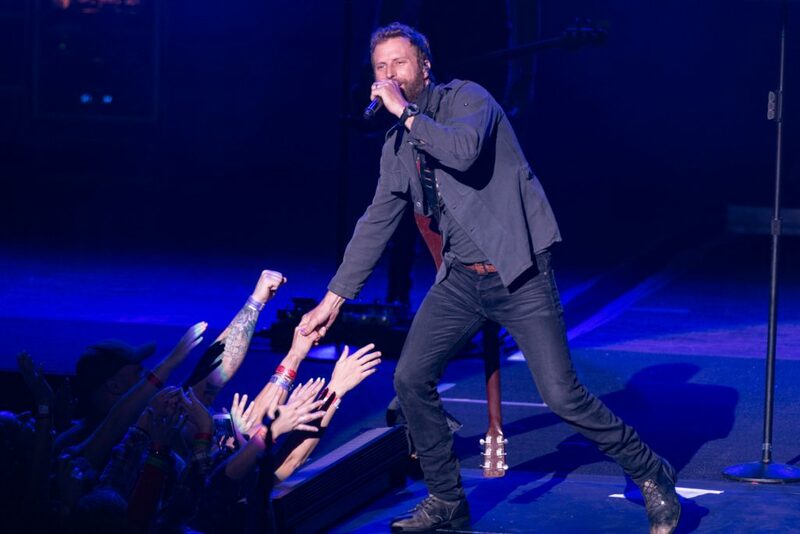 Dierks Bentley’s Mountain High Tour is the second headliner to perform at the venue for the season and it was a phenomenal way to kick it off. Opening for Bentley was Maryland natives Brothers Osborne and LANCO. The Mountain High Tour stage (which is not overly innovated) was perfect for this show. It featured a runway that jetted out in the crowd, which Bentley would use to interact with the fans. The stage also featured a hydraulic staircase which Bentley would use as a symbolic climb during one performance and later a ‘sitting on the dock’ feel for the slower tunes. Dierks BentleyÕs Mountain High Tour visits Merriweather Post Pavilion on a rainy Friday night. The concert featured Dierks Bently, Brothers Osborne, LANCO and DJ AYDAMN. Bentley moved all over the stage, profiling each of the musicians. At one point he moved into the crowd to a small stage set up near the soundboard as the crowd ate it up. This welcomed addition to the show allowed the “cheap seats” – the lawn crowd to get a better view. An ultimate showman, Bentley is as good live as he is on studio recordings. He interacts with the crowd and has a storyteller’s style to his lyrics. His fans sang their hearts out to hits such as, “I Hold On”, “Free and Easy”, “Somewhere on a Beach”, “Woman, Amen”, “Different for Girls”. May 18, 2018, Columbia, Md. 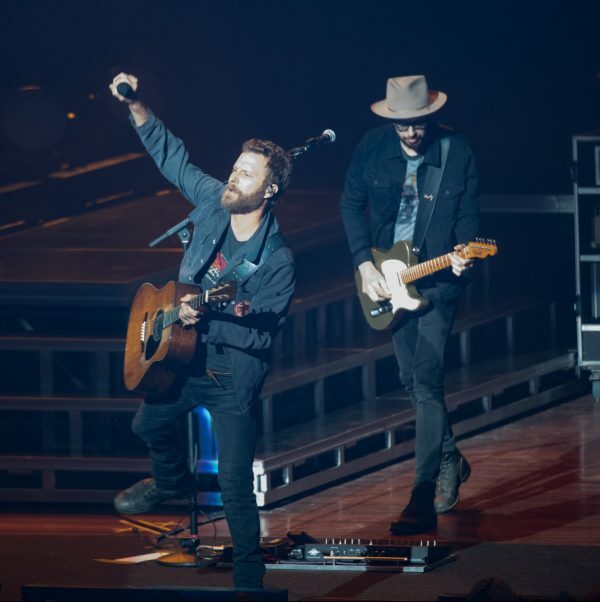 – Dierks BentleyÕs Mountain High Tour visits Merriweather Post Pavilion on a rainy Friday night.The concert featured Dierks Bently, Brothers Osborne, LANCO and DJ AYDAMN. In an emotional moment during the show, Bentley praised country music fans for being a supportive community and rallying in times of despair — referencing the tragic events a the Route 91 Harvest country music festival in Las Vegas where so many people lost their lives in the nations worst mass shooting. He also spoke about a survivor of last fall’s Las Vegas massacre. That person was in attendance at their first concert since the Route 91 Harvest country music festival tragedy. Bentley never identified the person but nevertheless, the crowd showed their support with a round of applause and cheers. During that single moment, there was a palpable positive outpouring of love and tears in the air that is hard to describe. The outpouring of love will most certainly continue tonight when Jason Aldean — who was performing at the Route 91 Harvest Festival when the shooting started — takes the stage at the 7 p.m. Other artists set to play Merriweatrher this summer include Earth, Wind & Fire, Smokey Robinson amongst others performing as part of the Capitol Jazz Festival; Robert Plant (with Sheryl Crow); Luke Bryan; Foo Fighters; Sugarland, and David Byrne. More information about these and other shows may be found by visiting the Merriweather. Correction: “Hey Pretty Lady” was not played by Bentley and the reference was removed from this piece.